"I'm writing this from Englewood, Florida, near Venice (south of Tampa). We arrived here just before the big storm last Monday (March 2). 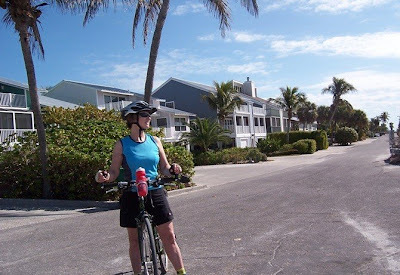 "We have our bikes and joined a bike club down here (Coastal Cruisers). I took my first ride with them yesterday morning (March 3). It was cold - in the 40s - so only about 3 dozen showed-up, half the normal number. They break the group down into sub-groups depending on speed. I found this out when I went off with the first group, which was doing 20+ mph, which is fast, even on the flat with a little tailwind. "Lots of retired folks - it's Florida - and very friendly. They have 3 standard rides each week. There are various bike paths and bike lanes in the Venice-Englewood-Northport area. But yesterday most of our ride was in a large sub-development, adjacent to a 5-mile long pike path, which had very few houses. Most of the roads in the development were vacant, so they acted like big bike paths as our group zoomed around them. They mark routes with colored circles and a line indicating a turn. Nonetheless, I managed to get a little lost when I left the fast group and headed back toward the trailhead using just the sun as my directional guide. No hills but the winds can be strong. "We hope the weather warms in Maine by April, because we'll be used to 70-85 degrees by the end of March, when we start our return drive. The weather has been, and is forecast to be, like a perfect summer day in Maine: 75-80, with RH around 50%. The air feels so wonderful after the dry Winter air of home. "We took another ride with the Coastal Cruisers Bicycle Club today (March 10) - my 4th since last Tuesday. This one, like some of the others, was a breakfast ride: bike somewhere to eat, then continue biking. We must have had a total of 50 people, who did the 28-35 miles split in 3 groups, depending on pace. Some others, including one 78-year-old in the same condo complex we're in, biked from where they live and did a total of 60 miles. We went to the monthly meeting of the club last night and they had 90 people there, out of a membership of about 325. Almost all are retired and most are snow birds. Very friendly group - an instant community for us. "The area has a lot of bike lanes and many roads in subdivisions that didn't get completed: long avenues with many side streets, yet very few houses. Essentially no cars in some areas. One area, called Rotunda West, is circular - about 44 miles of radial and circumferential roads. I wouldn't want to be in there on a cloudy day without a map and compass! "I'm including a couple of photos, although I haven't taken many while cycling - too hard to stop.